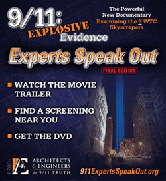 Unwavering supporters of AE911Truth, Like you, we at AE911Truth are dedicated to exposing the truth behind the events of September 11, 2001. For 8 years, we have advanced this goal through broad education of the public, the media, elected representatives, and technical professionals. history. These target audiences are among the millions who, this year, will find themselves confronted with the irrefutable video evidence of WTC 7's catastrophic destruction. Why? Because you've asked us to not just continue the successful ReThink911 ad campaign – but take it to the next level in 2014 – to the computers used by those who are in positions of influence in technical circles. This is the second strategy of our Bold Agenda in 2014. We are asking you to help us put the video of the free-fall collapse of WTC 7 in their faces. You can do this by becoming a member of AE911Truth in 2014. 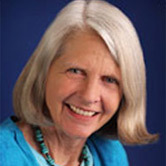 Frances Shure, M.A., L.P.C., has performed an in-depth analysis addressing a key issue of our time: "Why Do Good People Become Silent—or Worse—About 9/11?" The resulting essay, to be presented here as a series, is a synthesis of reports on academic research as well as clinical observations. In answering the question in the title of this essay, last month's segment, Part 2, addressed the anthropological study, Diffusion of Innovations, which discusses how change occurs in societies. These anthropologists discovered that, within diverse cultures, there can be found groups that vary in their openness to new ideas and technology—groups that fall within a neat bell curve. The success of the spread of an innovative technology or new idea reliably hinges on one point: whether or not opinion leaders vouch for it. In this context, the mainstream media can rightly be seen as promoting the official myth of 9/11, and therefore aiding and abetting the crimes of September 11, 2001. We continue Ms. Shure's analysis in Part 3 with the authority experiments of Stanley Milgram, Jane Elliott, and Philip Zimbardo. We reported back in October that we were Encouraging the Senate to ReThink 911 when we visited them during our September Action of the Month. We detailed Pamela Senzee's visit with Ben Sundholm, Legislative Correspondent for Senator Jeff Flake (R-AZ). In this article we highlight the other actions we took to educate members of Congress while we were in Washington. Wayne Coste, P.E., visited several Congressional offices the week before the DC911Truth Conference. We then invited conference attendees to join us in visiting their members of Congress. AE911Truth founder and CEO Richard Gage, AIA, hosted a group amounting to a dozen who traversed the honored halls the day after the conference. 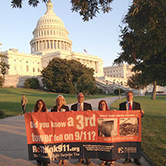 To support the Rethink 9/11 campaign inexpensively, activists in Connecticut took a novel approach to doing outreach by creating homemade Rethink911 banners. 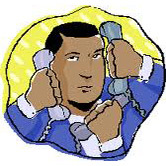 Local organizer Wayne Coste, PE, said that, "One of the issues when doing outreach is how many people will see the message and how much effort it will take. Our group did not have the funds for paid advertising, so we decided to try a homemade traveling billboard. Furthermore, it could be made to be fun, and that is a definite bonus." Co-organizer Carl Henry Seeger said, "One of our members was able to print off a series of 11x17 color segments that could be taped together into a double-sided banner." The 9/11 Truth Movement in Canada has been fighting for its right to run ReThink911 ads in the Ottawa public transit, OC Transpo. 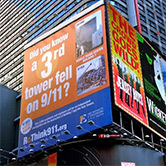 The ReThinks ads read: "Did you know that a third tower fell on 9/11? World Trade Centre Building 7, not hit by a plane, collapsed in free fall 7 Hours after the Twin Towers". Many volunteers are modest about their accomplishments, but Jerry Carpenter was even reluctant to be interviewed for this article. "I'm not sure I deserve this recognition," he said. The facts don't bear this out. He is the ultimate in grassroots activists. Jerry especially enjoys his work on the Public Outreach Team. He has also worked with teams dealing with congressional outreach, cable access, college outreach, and law-enforcement outreach. His local sheriff was deeply moved by the information Jerry gave him. Team Leader Dave Slesinger says, "Jerry has helped immensely in building grassroots support. He's called at least 1,000 people in recent years."